If you’ve flown in Europe with KLM Royal Dutch Airlines anytime over the past couple of decades, your co-pilot just may have been the Dutch king, Willem-Alexander. In an interview with Amsterdam newspaper De Telegraaf this week, King Willem-Alexander revealed that he recently ended his role as a regular “guest pilot” after 21 years on KLM’s fleet of Fokker 70 aircraft. The only reason he gave up was to re-train to fly KLM’s B737s, as the Fokkers are being phased out. Before that, the king worked for Dutch carrier Martinair – carrying on his royal duties throughout and flying about once a fortnight, always as co-pilot, a position sometimes called first officer. KLM currently uses its Fokker 70s to fly between Amsterdam and cities in Germany, Belgium, Britain and Switzerland. 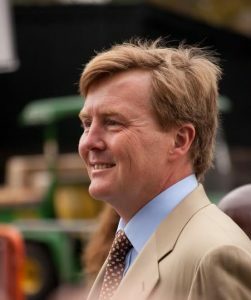 King Willem-Alexander, 50, has three children and is king to 17 million Dutch citizens. “You have an aircraft, passengers and crew,” he told the newspaper. 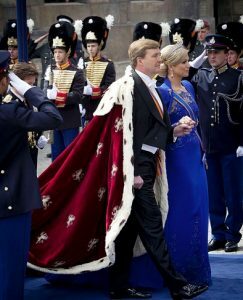 The king said passengers seldom recognise him – perhaps because he is in KLM uniform and not dressed as below. MEANWHILE, in a footnote, Air France KLM has just posted a healthy first quarter result, with solid traffic performance. The number of passengers carried grew by 5.2% to 20.9 million and revenue passenger kilometres (RPKs) grew 4.2% leading to an 0.7% load factor improvement.